With service delivery generally at its low around the country, the living conditions in most high density suburbs have been mostly undesirable. But for occupants of the Single Quarters and the General Barracks sections in the high density suburb of Rimuka, Kadoma, the living conditions are certainly unimaginable. At the Single Quarters section, a single room can accommodate more than 10 family members while bathrooms and toilets are shared by the whole community which consists of more than 800 households. There are 10 toilets for both men and women with an average of five chamber holes which cater for all the households while residents from nearby wards also use these toilets which have turned out to be more of public toilets. There are no control measures to ensure the cleanliness of these toilets which during the night are sometimes turned into love nests. And one can just imagine the situation inside the toilets. In actual fact, the toilets have turned out to be death traps as residents are exposed to diseases such as cholera and typhoid on a daily basis. Inside these toilets, human waste is strewn all over the floor and the fact that the flushing systems are not working makes the situation worse. Maggots and flies have found a breeding space inside these toilets while used condoms are also a common sight. These are the toilets that young children use for ablution. Erratic water supplies have characterized this place for a number of years and indeed, the place has become a breeding ground for diseases such as cholera and typhoid. The area has also not been spared from non-collection of refuse. Sewer bursts are quite common and sewage can be seen flowing almost everywhere. Due to the fact that the ablution facilities are public, some residents in this area have to walk about 50 meters to visit the toilet and this has made the bucket system popular especially during the night. And in the morning, human waste can be seen almost everywhere. Some have even resorted to relieving themselves in their backyards while others have built makeshift toilets- and all this makes the situation even much worse. The bathing rooms are also public and privacy has ceased to exist in these areas. Gogo Busha says she is still living in this area owing to desperation “otherwise this area is unfit for human habitation”. “It’s by the grace of God that we are still alive. Last time I was admitted after I suffered from cholera but the fact that I am still here living under the same squalid conditions means I remain susceptible to diseases such as cholera and typhoid. It’s only that we do not have anywhere to go otherwise this place is certainly not fit for humans. “I stay near one of the public toilets and I am one of the most affected residents because people always come with buckets full of waste and dump near my home,” said Gogo Busha. Kadoma was one of the areas which was hard hit by the cholera outbreak of 2008 which claimed over 4 00 lives around the country. Prostitution and drug abuse have also become common as culprits take advantage of the squalid conditions at the Single Quarters and the General Barracks. “Even young children have also been exposed to prostitution and drug abuse. When you live under such squalid conditions, immorality is bound to be high. In actual fact, disorder is the order of the day here and it is not surprising to see young children engaging in drugs abuse or prostitution,” said Mavis Mvululu. 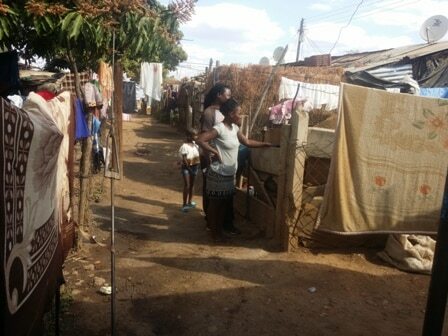 Kadoma Mayor, Muchineripi Chinyanganya dmitted that the “communal toilets” shared by the residents of the Single Quarters and General Barracks sections are inadequate adding that the areas have become unfit for human habitation. “The plan is to demolish those houses and build habitable family units. The major challenge however is financial,” said Chinyanganya. The Centre for Community Development in Zimbabwe (CCDZ) has identified Kadoma as one of its focus areas under its Local Governance-Service Delivery forums aimed at enhancing citizen involvement in demanding effective service delivery. The forums are aimed at creating platforms that bring together residents and duty bearers. Last week, CCDZ hosted a discussion forum in Kadoma during which residents expressed concern over the failure by the council to address their concerns. The residents highlighted that there is need for constant engagement with duty bearers who are often evasive when they are engaged. CCDZ Advocacy Officer, George Makoni highlighted that his organization will continue to strive for effective service delivery by calling duty bearers to account. “We discovered that quite often, residents do not have platforms through which they can engage with duty bearers such as councilors and we have created these forums as a way of calling duty bearers to account while mobilizing residents to participate in issues of service delivery. “We are also empowering ordinary residents on the various ways through which they can engage with duty bearers in demanding effective service delivery,” said Makoni.